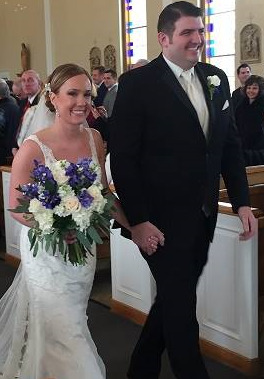 Elizabeth A. Radder and Daniel P. Reedy were married at 3 p.m. on Jan. 16 in Queen of Heaven Catholic Church, West Seneca. Guests gathered for a reception at Salvatore’s Italian Gardens, Depew. The Rev. Thomas Quinlivan heard the couple’s vows. The bride’s parents are Paul and Cathy Radder of Lancaster. The bridegroom’s parents are Daniel and Colleen Reedy of West Seneca. The bride is a graduate of Mount Mercy Academy. She earned a bachelor’s degree in sociology and minor in criminal justice from Canisius College and also earned a master’s degree in social work from the University at Buffalo. The bride is a social worker at Erie County Medical Center. The groom is a graduate of St. Francis High School. He earned a bachelor’s degree in communications from SUNY Buffalo State. He is a registered nurse at Catholic Health. After a trip to St. Lucia, the couple will make their home in West Seneca.